Have you recently acquired an Alexa and are looking for pop culture updates without all the ads? Want to hear the day’s geek headlines specially curated for every level of fan? Then you’re ready to Let Your Geek SideShow with the Alexa news briefing skill! Install the Amazon Alexa Skill for Pop Culture & Movie News- Let Your Geek SideShow and get all the latest updates in a convenient and timely fashion, known as your Pop Culture Flash Briefing. There are two ways to add Let your Geek Sideshow to your Flash Briefing. You can first, go to alexa.amazon.com in any browser OR open your Amazon Alexa app on iOS or Android. Click on ‘Let your Geek Sideshow’ and then click ‘Enable Skill’ to add it to your Flash Briefing. Click on ‘Let your Geek Sideshow’ and then click ‘Enable Skill to add it to your Flash Briefing. Once set up, simply say ‘Alexa, give me my news briefing.’ This will initiate your pop culture flash briefing, with our selection of the latest geek headlines in movies, comics, television, streaming, gaming, and more. If you enjoy the content, be sure to leave a 5-star Amazon review to help more geeks find and utilize our Skills program. 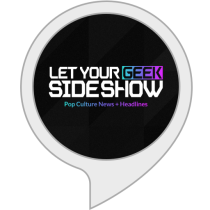 Get ready to Let Your Geek SideShow with Pop Culture & Movie News from Alexa!